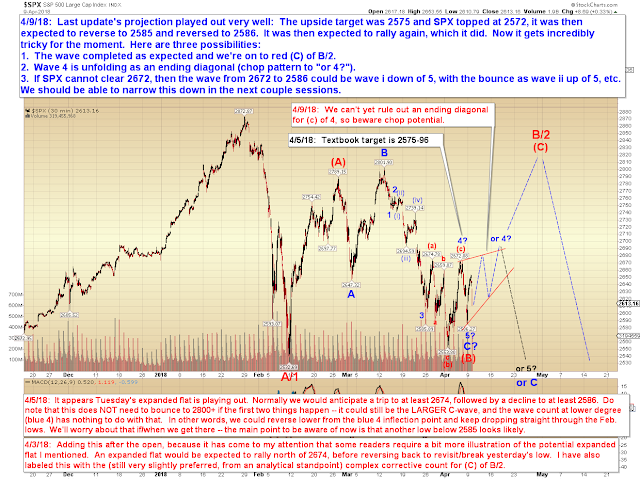 Pretzel Logic's Market Charts and Analysis: SPX Update: Market Shifts Out of "Easy Mode"
SPX Update: Market Shifts Out of "Easy Mode"
Last update expected that SPX would rally toward 2675, then reverse lower to 2585, then rally again. In actuality, SPX rallied to 2672, then reversed lower to 2586, then rallied again. Calling two large turns in advance, both within 3 points, isn't too shabby -- but now it gets complicated again. Option 3 (on the chart above) will be invalidated north of 2673. Option 2 would be invalidated with immediate sustained trade north of 2706 -- please note that 2706 is no longer the invalidation level if we follow the choppy path shown. In an ending diagonal, wave iii is not allowed to be longer than wave i, so wave iii would need to stall shy of 2706, but wave v could later exceed that level. Do be aware that even if both option 2 and 3 invalidate, that will not automatically guarantee that we're in red (C) -- but we'll burn that bridge if and when we come to it. In conclusion, last update's anticipated path played out well enough, but from here we should await further info from the market before we attempt to develop a high-confidence outlook. On the bright side, we do have two clear price levels to watch, to help narrow the options. In all likelihood, we'll be able to narrow these down within the next few sessions. In the meantime, trade safe.